Haha! Sap is running and so was I as it took longer to walk up the road, SEE the buckets through the trees, and then find the lens cap-don't ask. I was late back. Nice lines textures and capture. Love the contrast the grey buckets give! Is this the same sap they use to make syrup? 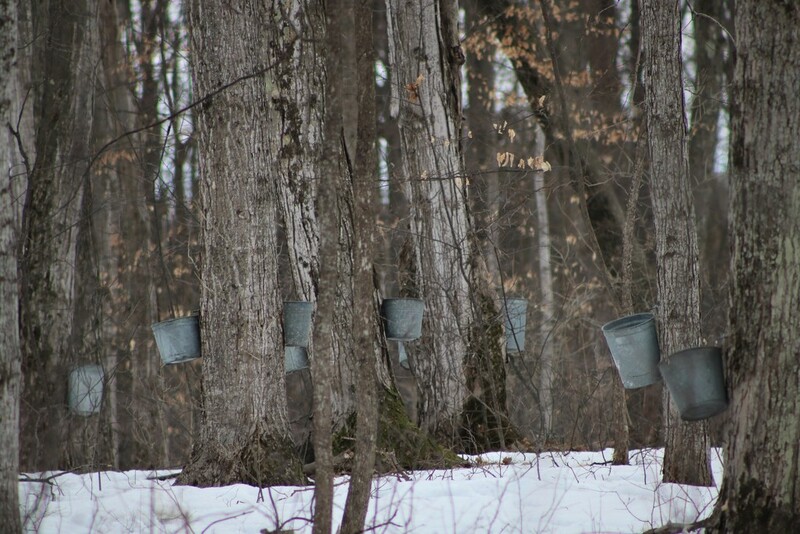 If not, why do they use buckets to catch sap? Love the leading lines of the trees, up and down, to the buckets! This is the second maple syrup bucket shot I've seen in the last week or so and now I'm craving REAL maple syrup (not that we use the store-bought stuff!). I have lost two lens caps and now I am psycho when it comes to taking them off outdoors! Good shot! Well captured! Yummy times ahead! @jenp Yes indeed! Soon there will be maple syrup. Thanks for looking in! @olivetreeannThanks so much! The cap was in my OTHER pocket-haha! @taffy Thanks! I took a lot of shots...this was second to the last.